This post is part of a blog train which was initiated months before, you are reading a scheduled post prepared a few days ago. We have joined the nation in mourning from Mar 23 to Mar 29 2015 for the lost of our beloved founding father Mr Lee Kuan Yew. During this period we will not be sharing any post on our social media platforms. That just about sums up what its going to happen fm now till end of school year, which is for the next 8-9 months. So what did I do? *heaves a big sigh* Well... a Mum gotta do what a Mum gotta do. I threw the letters on the table and said to myself "These can wait! Tomorrow is the start of the school holiday, we are going to have some fun!" Woohoo! You probably said "Ah! This crazy Mama! How can she just ignore all these important stuffs and concentrate on play play play!??!!" *Ahem* There are more to chasing these academic trails and trying to catch grasp its tail(s) so that we are not left behind. I was not this relax and care less when the Mum Crown was thrown unto me some 9 years ago. I read extensively on raising babies, about baby food, milestones, and the whole 9 yards. I started to worry when he fell short against the milestone chart; imagine not speaking even single proper words at the age of 17 months, or even his teeth are not sprouting when friends with babies of almost the same age as my son have teeth coming out like flowers blooming during spring time! You get what I am trying to say? So, yes I am throwing aside things that are not really important at that moment and concentrate on spending quality time with my boy NOW. Aye! Those were the daze days, stressful days I tell you. Looking back, it got me thinking... How was MY Motherhood Journey? How did I Embrace it? *cue crow flying across my head... and the goldfish memory kicks in* Yupe I almost do not have an answer to that... Frankly, DinoPapa remembers MORE on the things I did with DinoBoy because he has a memory of an elephant (HAHA! ), but one thing is for sure, Motherhood journey is never an easy one, it has it's Ups and Downs but it was never boring. Sure, there were times where things got tough and difficult for me to get through, those episodes brought me down to my knees but it will never break me, I ranted, I cried then I brushed the dust off myself, got up and continue my journey. After scouring this blog for clues and going through the million photographs in my laptop, I managed to refresh my memory. OKAY OKAY, Just kidding!!! Seriously now, Motherhood means more than nurturing, educating and providing (both food and clothes) necessities to my son. It means being there with and for him, creating lasting memories with the things we do together. It means appreciating him as he is while trying to mould him and instill some values into him so that he can be a better person in future. And now, I let you peep at the 8 things (there are more, I will probably have to do 2 blog post on this topic if I were to list all down) I did with DinoBoy these pass years. They say taking care of a newborn is tough, you get interrupted sleep or not enough sleep as you have to wake up every few hours to feed the baby. Well, I am blessed, in a way, I can't breastfeed the boy so I have to put him on formula milk, therefore no waking up every few hours to a hungry baby, he slept till the morning. He got his full 12hours or more sleep and I had my 8 hours of beauty sleep. How is that possible you asked? The Baby Whisperer method helps plus I secretly think that my son loves to sleep and needs ample sleep to function well the next day. No, this is not a tagline of Starhub Cable TV ads, this is about a certain 9 year old boy. This only child in the family wants your attention 24/7, shoot you questions every 30secs about every thing and anything under the Stars the Moon and the Sun, oh plus every thing that is in the outer space and beyond. And I was worried sick when he wasn't talking much at 18 months, could I have that quieter boy back please? Let's not forget about the "Why? ", the "How?" the "Do you know" the Mum, can I ask you a question" moments... Eh, I'm not a walking encyclopedia nor a dictionary or Google! There were moments after he asked me a question he will say "Oh! Sorry Mum, I forgot you did not study Science, I'll go and ask Dad." Wait. wait wait!! I KNOW the answer to THAT question! Ggrrrr!!! Too late, he has already ran off to find Dad. Maybe he should have a Nanny A.I. to save this Mama such "embarrassing" moments. Mummy! You are so FUNNY! 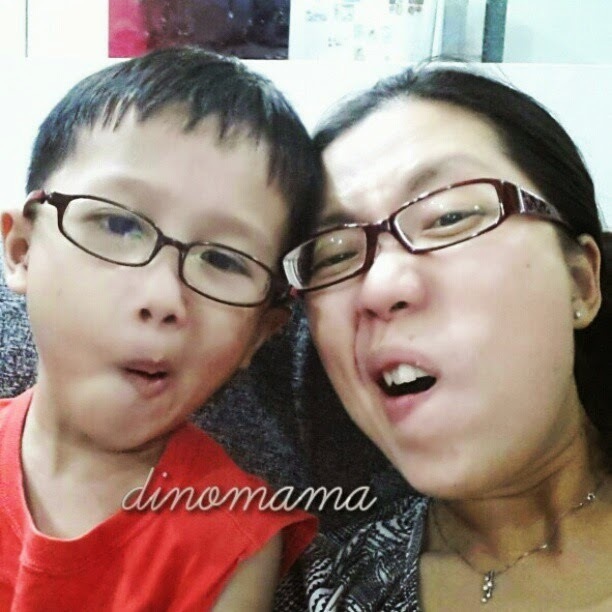 Yupe, acting funny and silly or even make up funny songs on the spot to amuse the boy. After that both of us will laugh out real loud and those near us will be staring at us wondering what's wrong with this pair of mother & son. I have also added in some funny dance moves to the songs too but these are only reserve for the family to see or when I am 100% sure no one will be watching me while I dance because I'm not that comfortable with people staring at me with my gawky, crazy, funny dance moves. We play a lot too, in a post I shared on the blog on September 2014; Play with me Mum and Dad!, I was an outdoor person, but never some one who exercise or do things that strain my muscles and tires myself out. I did it because I wanted the boy to experience the joy of being out door instead of being cooped up at home facing the wall, the tv, the electronic screens. In the public, with million of eyes staring at us, at me, while I was scolding the then 2-3 years old crying/sobbing DinoBoy and punished him to stand against the wall or at a corner as he had misbehaved. I am sure I got stabbed million of times by those dagger stares but I stood my ground. 9 years on, I emerged the winner because I have a boy who knows I expects his best behaviour at certain occasions without being told and he knows when he is allowed to run free like a wild horse (with me watching him like a hawk of course). I never knew the real meaning of being driven up the wall till I have this little boy who many a times did things that makes me not only want to explode but also scream out loud at the top of my lungs in frustrations. Imagine Aslan, the lion in The Chornicles of Narnia, roaring loudly at the enemy, well that's exactly how I felt during those times. We love to go shopping and always wonders away from each other, looking at our own stuffs. How to find each other when I have a phone and he does not? It's too expensive to buy a set of walkie-takie that will only be used occasionally. Do a mad dash up and down the aisles to try to find each other? Nah~ that's too tiring! So we came up with a solution, we will always keep our ears "open" the minute we stepped into the shop, be alert and ready to hear our secret code. After that I will stay put while DinoBoy will try to follow my voice to my location . Works wonder! No more cat & mouse chase in the shop, no more shouting "Mum! Mum! Where are you!" and making a dozen mums turn their head around in respond. When DinoBoy was younger I got away with carrying diaper bags in loud & vibrant colors that you will never see in my bags collection. We've had backpacks & water bottles of cartoon characters such as Spiderman, Batman, Thomas the Train, Elmo, Angry Birds etc, you name it, we probably had them before. 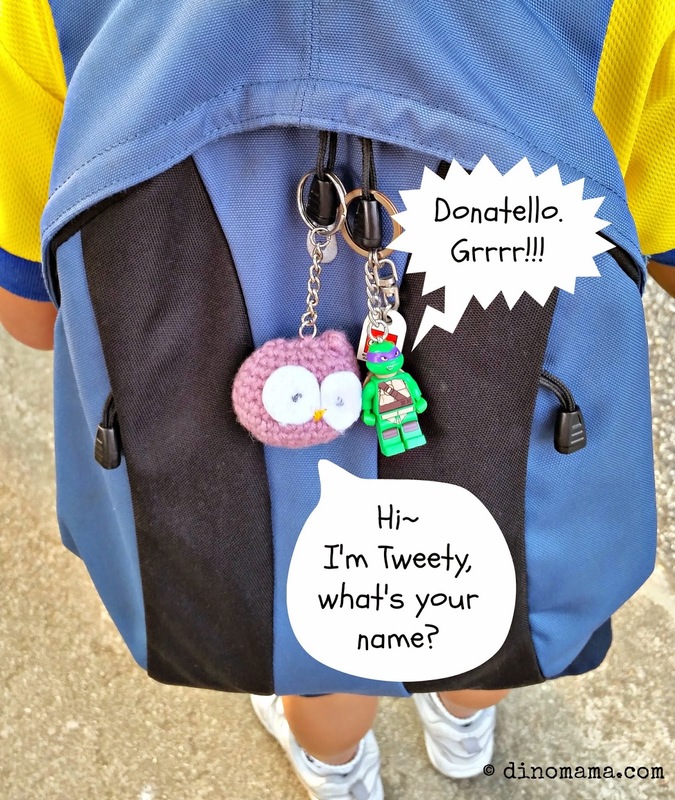 Now for a short trip to the nearby mall I'll just grab DinoBoy's weekend backpack with the Donatello Lego key chain & the cute Tweety crochet owl that I made, throw in my wallet and off I go. I carry it like its a very expensive LV bag but truth is I probably look comical with a backpack that looks a tad too small for me on my back, but who cares! "The Harshest Punishments, The Best Rewards"
Since he was a toddler, we expect the best out of him, we make sure he knows basic values such as Respect, Politeness, Responsibility, Obedience, Good Manners, Friendliness, Selflessness, Sharing, Honesty (I may have missed out a few), we demand him to be at his best on occasions. This means that I have to discipline him; or my sis said "micro managing", every other minute. We were harsh on him at times, we don't like it but we know we have to do it. Very Old School thinking and teaching I know, perhaps there are other ways or method to do it but with this Mama does not have Patience as a virtue when it comes to dealing with the boy who is intelligent, quick witted, strong headed, bad tempered. The boy once wrote in his school Journal and told a friend that "My mum gives me the harshest punishment when I misbehaved but he best rewards when I am good." He did not said it in a resentment tone but rather in a as-a-matter-of-fact tone. It's like he knows this is the way it is and will be, nothing unfair about it or enough for him to complain about it. I may be judged again on this but its ok, I know I have raised my son well using this method. He may still lack in some areas but at the minimum he shows respect, gratitude, appreciation & righteousness. He's ever so ready to tell the food court ah gong ah ma "Thank You!" when they clear bowls and plates after we are done eating, this made them very happy, some even commented "so guai (good boy)". Just the other day, we were collecting tickets at the Golden Village ticketing counter, this auntie behind the counter was wearing a surgical mask and speak with a hoarse voice, apparently nursing a bad throat infection, before we leave he told her loudly "Hope you get well real soon!" I am sure he made that auntie feel great for the rest of the day. I know you are dying to know what harsh punishments we dished out to him. Besides blowing my top at him, ignoring him for the rest of the day, the ultimate one is... No screen time lor! That's his "death sentence" arh! This is because he only gets to play with ipad, smartpones, laptop and watch tv on weekends; technically on Sunday since we are out most of the time on Saturdays, so he treasures the time when he can lay his hands on these gadgets. And the best rewards? Well, anything he fancy and most of the time its a book he wanted or a trip to his favourite restaurant. 9 years on and I am still learning, tough job I tell you. Now that he is in Primary 3, I can relax a little bit and in a few years time I will have to learn how to tackle him when he enters into tween or teen stage. Given the stubborn genes in him, I foresee that we will be at loggerheads most of the time, I will TRY to change my attitude so that I won't lose him in the midst of all those disagreements, afterall he is my one and only precious gem, my Priceless Son. This is part of a blog train hosted by Dominique from Dominique's Desk. 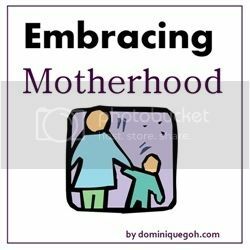 Join us as we share our thoughts on Embracing Motherhood. Next up on the blog train is Danessa from Prayerfull Mum. Danessa was a school teacher for more than 6 years. When her husband received a scholarship to study his Masters in Georgia Institute of Technology, she started to embrace the new season in her life as a Stay-at-Home Mum when they moved to the United States of America in 2012. Kids really change us a lot. Without them we will never experience the complexity of motherhood and all the joys that it has brought and will bring us. Glad to have you on the blog train.